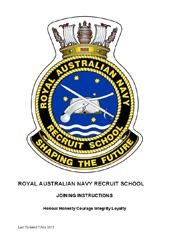 Congratulations on being selected as a member of the Royal Australian Navy (RAN)! This is your first step to a career in the Australian Defence Force. Your initial training at Recruit School (RS) will prepare you to be a sailor in the RAN. You will then progress to a Category School where you will gain your specialist skills in your chosen fields of endeavour before joining the wider Navy community on ships and establishments around Australia. You can look forward to an interesting and challenging lifestyle that will offer opportunities for promotion and travel. The Navy Recruit School, in HMAS Cerberus, is situated on Western Port Bay, Victoria about 70 kilometres south east of Melbourne. All aspects of your travel to HMAS Cerberus will be arranged by the Recruiting Centre. Recruits joining from outside Victoria will be met by members of Recruit School staff at Tullamarine Airport. Recruits joining through the Victorian DFRC will be met at the Centre by Recruit School Staff. Do not bring your own vehicle, requests for access to HMAS Cerberus of private motor vehicles/motor cycles will be considered on a case-by-case basis later in your Recruit training. On arrival you will become part of the Division responsible for the conduct of the training for your intake. You will receive a welcome address by the members of RS Divisional Staff, be allocated your accommodation and be informed of the Navy’s expected standard of behaviour while you are in RS. There will also be a lot of information given in a short time so it is important to pay attention and to take notes. Additionally, you will need to complete a number of forms (e.g. Next of Kin, Superannuation Application, Pay, Tax File Number...) and provide some basic personal information. So bring a note book and a pen on the day. Your first few days at RS will be taken up with administration, medical and dental checks, kit issue, haircuts, initial parade training, the RAN Swim Test and the RAN Physical Fitness Test (RANPFT). During Recruit training you will be accommodated in six berth cabins within an accommodation block. Whilst males and females share an accommodation block, they are located on different floors. Each floor has communal laundry, shower and toilet facilities. You will be required to keep your cabin and communal living areas clean and tidy. Extremes in colour and style will not be permitted. Male and female hair colour must be as close to your natural hair colour prior to your enlistment date and while at RS. A full-time hairdresser is available by appointment at HMAS Cerberus. Shaved or partially shaved heads are not permitted. Females may have their hair cut at Commonwealth expense in the first week of training. Hair below collar length is required to be worn in a bun. Hair combs the same colour as the hair may be worn; one on each side. ‘Scrunchies’ are not permitted and hair is to be a uniform natural colour. Males will be given a Number two (2) crew cut in the first week of training at Commonwealth expense. All subsequent hair cuts will be at the individual’s expense. Facial hair is not permitted whilst at RS and hair is to be a uniform natural colour. The Recruit recreational area (Sobraon Club) has a pool table, table tennis, television and DVD facilities, internet café, juke box and a small canteen. Most areas of HMAS Cerberus are out of bounds to Recruits, however, a number of facilities and support services are available at HMAS Cerberus. Recruit (surname & initials) Personal No. RS staff will advise you of your personal number and intake number either on the first or second day of your enlistment. Recruits who successfully complete the course participate in a Graduation Parade which is normally held on Friday of the last week of training. Recruits will have the opportunity to invite up to four (4) family or friends to view the parade which will commence at 1000h.